Two suitcases in tow, one optimistic Scottish girl in pursuit, I embarked upon an experience I will never forget; my Malawian adventure. Arriving in Lilongwe airport, exhausted and ready to start my journey ahead. I was apprehensive and to put it simply, downright terrified of what I was about to face. But this was my dream and I made a promise to myself that no matter what, I would follow my dreams, after all you only get one life and I was more than ready to make mine the best story in the world. So it began, my month long experience as a sports and community volunteer in the one country I had dreamed of visiting since I was old enough to dream. Arriving at the volunteer house I was greeted by Nola, the most incredible example of a human being I have ever encountered. A heart big enough for the whole world and a sense of humour that put me right at home. I settled into a routine quick enough and then it was time, ready or not Malawi, here I come. I arrived in the orphanage merely days after my arrival, ready to start my duties and help in any way I could. My roles were pretty simple, myself and my fellow volunteer were tasked with collecting the water in the morning for the children’s porridge, we collected and carried the water from the water pumps to the orphanage each morning. The whole carrying the water on your head? Its. Not. Easy. I will say it once and I’ll say it again, give those woman a medal. I tried, god loves a trier and all, and boy did I fail miserably. My upper body strength, or lack of it, was truly put to the test. As fun an experience as this was, hands down, my favourite part of my role within the orphanage was the children. These tiny, incredible little people with big hearts and loud voices made their way into my heart. These wonderful little humans sat on a floor, learning using a curriculum that was painted on the wall, we taught using a stick, pointing to each subject as the children repeated after us. So minimal, so simple, yet they listened (for the best part), they actually wanted to learn and participate. They had no pencils, no paper, no tangible methods of learning but they were grateful. It was the most humbling experience of my entire life. I brought with me the one thing no money could buy, unconditional love. I dished out hugs like they were going out of fashion, we had conversations about nothing and anything and if I’m truly being honest, they taught me more than I could ever have taught them. Having previously been a nursery teacher I came into this experience armed with songs and activities galore, I had the bumble-bee song tucked carefully in my pocket and I was ready to use it. The orphanage teachers I had the pleasure of working with are two of the most amazing people I have ever come across in my twenty years on this earth, they dedicate so much time and energy to providing these children with the best start in life they possible can. Throughout my experience in the orphanage I witnessed children with merely the bare necessities, I encountered orphans with no parents to go home to, but what I did not come across, was negativity. I was welcomed into the homes of Malawian residents with a hug and a smile, I was welcomed into their lives no questions asked, no qualms about where I came from or what religion I followed, no judgment because of the life I was born into, just pure, unconditional acceptance and love. Now, if people born into nothing can find the hidden positives in their life, what’s stopping you? My other role in Malawi was the role of a sports volunteer. I coached MVO netball team throughout my four weeks. My netball skills were well and truly put to the test, here’s hoping my primary school standard netball skills could match up (spoiler alert – they couldn’t). But I’m going to tell you a story about the best group of girls I have ever had the pleasure of spending my time with, these girls were a force to be reckoned with and I’m truly sorry that you may never meet them, because they absolutely changed my life. These bubbly, funny, intelligent girls became my super team. They listened, they laughed and they hugged me a lot which is an automatic walkway into my heart. I came to care for these girls a great deal. Over the weeks we set up a training regime, they gradually got to grips with it and I would often appear for training to find them already warming up. I adopted some of my dads training tactics and issued laps for latecomers – that’s right, this Disney princess has a back bone (kind of…). At home, I raised money for bibs so that I would have something to give them upon arrival, little did I know how much they deserved this. They worked tirelessly throughout training, listening to my ramblings about the offside rule and following my feet to work through our language barrier. They taught me some Chichewa and I taught them what I would love to say was English, but outside of a learning environment my Scottish accent won the battle and I’m afraid I taught the girls how to speak like they had just crossed the Forth Road bridge into Fife. We gradually opened up a channel of communication and day by day, these girls made their way into my heart. 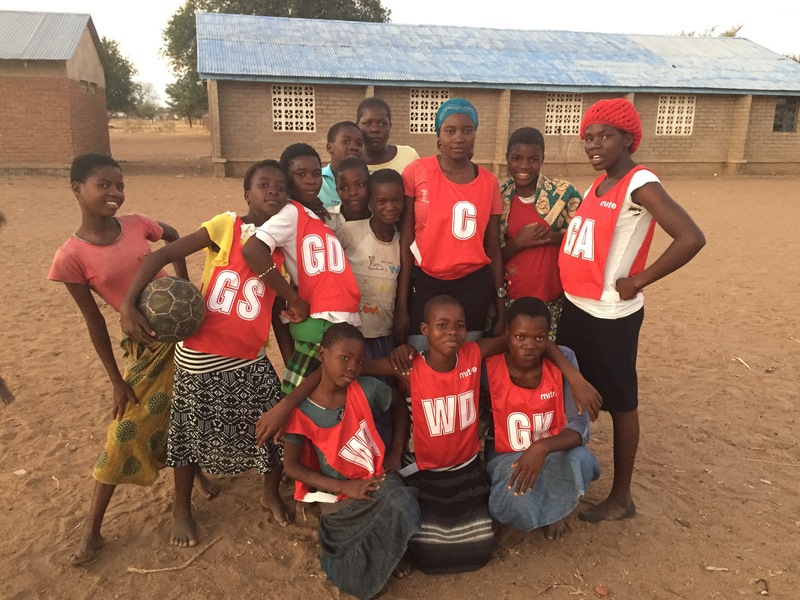 I left them with a heavy heart, promising that I’d never forget them and that I’d go home and fundraise to provide them with a real netball kit, it was the least I could do. Never one to break a promise, only months after I left I had raised enough money to buy the girls training tops and shoes. My girls were all kitted out and I couldn’t be prouder. MVO girls netball team will always have a special place in my heart, thank you for allowing me into your lives, I’m truly a better person because of it. My trip to Malawi was without a shadow of a doubt the greatest experience of my life. With the prospect of nothing they start each day with a smile and end it the same. On another continent people are embracing life as it comes, accepting one another for who they are and loving with very fibre of their being. I’m not saying its perfect, not at all, but the experiences I had left me stunned and in awe of this world so unlike our own. So pure and positive, so wonderfully simple yet so heartbreakingly deprived. There is no perfect world, no perfect life, but there is a perfect attitude and I was lucky enough to witness it in action. The people of Malawi have, for the best part, found their hidden positive. Were there things I would change? Absolutely. Were there aspects that broke my heart? Without a doubt. But did I leave Malawi a better person that I arrived? I absolutely did. Thank you for making me more understanding of a life so unlike my own. Thank you for allowing me into your home and your hearts. Thank you for showing me strengths I didn’t know I had. From the bottom of my heart, Malawi, I thank you. Having spent some time in Malawi myself, this piece really speaks to me. The people there were absolutely incredible and they certainly inspired me to find joy in all parts of my life, no matter what. Keep sharing your stories and bringing hope and positivity to this world!! “…these girls were a force to be reckoned with and I’m truly sorry that you may never meet them, because they absolutely changed my life.” Loved this story so much! Beautiful post! Sometimes the poorest of people are the most positive! The rest of us could definitely learn a thing or two!! !